The creation of local communities of prosumers fully empowered to participate in the electricity market at the low voltage substation level of the smart grid. A prosumer is empowered to optimize energy flows within his/her home via the self-consumption of the energy generated from distributed energy resources, peak shifting, flexibility sales and/or energy storage. 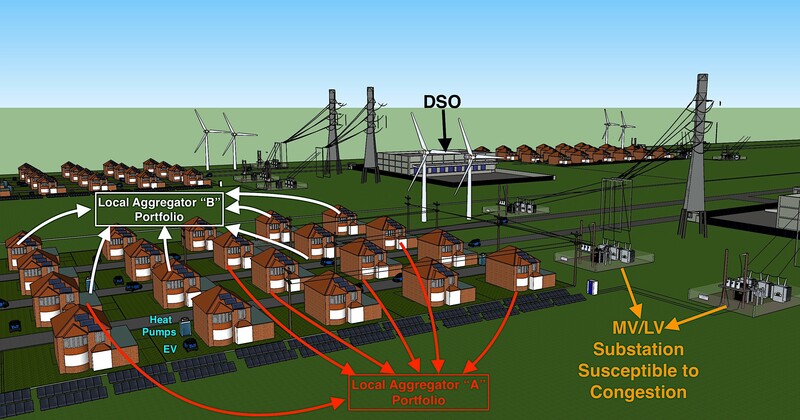 A local community of prosumers is enabled by an aggregator to collectively optimize energy flows inside the district in the absence of grid constraints. A local community of prosumers is enabled by an aggregator to collectively optimize energy flows inside the district in the presence of grid constraints. The 3-level storyline facilitates optimization algorithm development, use case development and the shaping of business model opportunities. The use cases align with the three levels of the storyline. MAS2TERING focuses first on roles, actors and services in the low voltage part of the grid (Prosumer, Aggregator, and DSO) and extends to the upstream value chain via flexibility sales on the flexibility market. A flow analysis (energy, data, revenue) is used to identify business model strategies and collaboration opportunities. The system-level business model is a multi-sided platform-based business model. This is consistent with recent advances toward smart grid business model development work . 19 business model opportunities are identified. They are categorized as primary and supporting. They are clustered by (Primary): flexibility as a product, in-home optimization services, flexibility services to the DSO, joint services business models, and (Supporting): knowledge and data services, telecom services, security services and referral services. 21 high level requirements are identified for further consideration and use in the project. Market analysis is carried out across the seven categories of Energy Market Policy, DSO Market Policy, distribution proportion of energy bill, tariff Structures, penetration of DER, penetration of electric vehicles and heat pumps, and the penetration of white goods. A weighting scheme is developed that assigns different levels of importance across the parameters, based on their relevance to Mas2tering potential impact. The weighting scheme is used to score the target markets with respect to which ones are most appropriate for Mas2tering solutions. Belgium and France top the list. Next steps in MAS2TERING business model development work include a deepening of business strategy and collaboration opportunity identification in order to shape combinations of the 19 business model opportunities into realizations of the multi-sided business model into specific business cases. In parallel, market analysis will continue with focus on developing the methodology and information necessary to support quantified analysis of the business cases and final development of the Mas2tering business models. : IBM White Paper “Evolution: Smart Grid Technology Requires Creating New Business Models.” By Michael Valocchi, John Juliano and Allan Schurr, – Available at http://www.generatinginsights.com/whitepaper/evolution-smart-grid-technology-requires-creating-new-business-models accessed 10 June 2015 – Accessed 14 April 2015. 2.2.2 “Prosumption” within the context of self-consuming local energy communities. Within the low-voltage portion of the grid, lie the most pressing challenge and opportunity facing the grid today. In very brief terms, the challenge is that increased electrification at the domestic level coupled to the increased presence of distributed energy resources (DER) places additional capacity demand on the LV part of the grid. When flows in both directions become too large this is called congestion, the system faces a risk and management actions are required. This portion is managed by a distribution system operator (DSO) and increased capacity demand has the potential to require significant imminent investment into grid reinforcements to maintain and ensure reliable distribution services . The opportunity is to resolve or mitigate these challenges is through the harnessing of ICT for automating changes in how and when consumers / prosumers consume, generate or store electricity. If homes can collectively level their demand load profile, then the available capacity at the LV level (and indirectly at higher voltages) can be optimized. To bring this opportunity to a reality, a new role of a flexibility manager  or aggregator  is foreseen in the energy market to act as an intermediator and facilitating agent between prosumers and traditional market players. The role being developed by Mas2tering is the one that combines the main aspects of flexibility management [7, 25] and aggregation  dubbed the Local Flexibility Aggregator (LFA), and the concepts surrounding it are explained in this report. However, with respect to the vision, it is this new role that will directly make use of the Mas2tering ICT platform to optimize the collective interactions between consumer, prosumers, and the LV-grid. To do that, in-home technologies are needed that can interact with the ICT platform, and intelligent decision making algorithms are required to orchestrate the demand, supply and storage actions of a large number of homes and a larger number of devices in those homes. Figure 2 shows a close-up image of the LV part of the grid addressed by MAS2TERING. DSOs manage multiple LV substations. In contrast with Figure 1, Figure 2 shows that some of the homes have solar panels, electric vehicles and heat pumps. Aggregators (potentially more than one) build portfolios of clients to offer services to consumers, prosumers, DSO and the electricity market alike. The novelty and strength of the MAS2TERING approach is to use decentralized decision making algorithms, which are best suited to coordinate a potentially very large number of prosumers and ensure prosumers’ choice and empowerment. Figure 2. Low Voltage (LV) portion of the grid where the MAS2TERING vision is implemented. B1. Sale of Flexibility by a consumer/prosumer to a Local Aggregator is appropriate for consumers/prosumers that do not require services related to in-home optimization and desire to gain value from offering flexibility to the market through an aggregator. B2. Sale of Flexibility by a Local Aggregator to the Flexibility Market deals with flexibility that a local aggregator may sell for purposes other than DSO Services. This flexibility is made available to the flexibility market where the buyer may be a DSO who does not require services, an aggregator of aggregators, a BRP or other market participant. B3. Sale of Flexibility by a Local Aggregator Service Contract to a predetermined buyer (DSO, Aggregator of Aggregators or BRP) deals with the predetermined sale of flexibility to a contracted buyer. B4. Time-of-use (ToU) optimization is based on load shifting from high-price intervals to low-price intervals or even complete load shedding during periods of high prices. This results in the lowering of the energy bill proportional to the price differential and quantities of energy consumed. B5. Self-balancing is typical for Prosumers who also generate electricity (for example, through solar PV or CHP systems). Value is created through the difference in the prices of buying, generating, and selling electricity. B6. Control of the maximum load is based on reducing the maximum load (peak shaving) that the Prosumer consumes within a predefined duration (e.g., month, year), either through load shifting or shedding. By lowering this maximum load the consumer can benefit from lower tariffs. B7. Bundled Flexibility Management Service the combination of optimization services coupled with flexibility (as a product) sales to a Local Aggregator. B8. Congestion management deals with the use of flexibility to attain the benefits of peak reduction, local balancing, the reduction of losses and voltage management in a discrete timeframe of high demand to avoid the thermal overload of system components. B9. Grid capacity management deals with the use of flexibility to conduct congestion management but also in a longer term horizon to defer grid investments to ensure future capacity needs and to extend the operational lifetime of system components. B10.Bundled Contracts (Phone-Internet-Energy) for the providing of In-Home Optimization and Flexibility Management Services deals with strategic alliances between utilities and telecoms to offer bundled services or with 3rd party organizations that self-organize to offer holistic bundled solutions. B11. The sale of congestion point forecasting to local aggregators as a service deals with the ability to create and deliver a competitive advantage and work avoidance via forecasting services. B12. The sale of consumer / prosumer consumption data to Local Aggregators or Common Reference Point Operators as a service deals with the data flow concerning consumer/prosumer load profiles and/or flexibility potential. B13. The sale of MAS IP to Local Aggregators to maximize price differentials between flexibility purchases and flexibility sales deals with the business model for the exploitation of the MAS2TERING foreground as it relates to the ICT platform / MAS IP. B14. The sale of MAS IP to In-Home Agent Manufacturers (white goods and renewable energy technologies) to increase product competitiveness and differentiation deals with the exploitation of the MAS2TERING foreground as it relates to the MAS IP. B15. Broadband Content, VAS and OTT sales deals with the sale of content licensing, Value Added Services(VAS) or Over the Top Content (OTT) subscription-based services by Telecom Operators to combined energy suppliers / LFA for enhanced device abstraction interoperability within major smart appliance categories connected to ZigBee, Energy@Home, 5G, cloud access channels, etc. B16. HAN Sales deals with the provision of Energy Box and related products / services in the HAN. According to the specific country and type of market the Telco company may also be the owner of the device and ask the final user to pay a fixed rate. B17.The sale of security software to ensure the secure transport of consumer/prosumer data deals with how software and data security providers add and take value from the system. B18. Compensation awarded by suppliers for new client referrals deals with compensation awarded for client base expansion. B19. Compensation awarded by telecoms for new client referrals deals with compensation awarded for client base expansion. This report has established the vision, approach, high level requirements, business model opportunities and initial feasibility analysis for the MAS2TERING project. The vision is centred on the prosumer and in specifing the development of a MAS2TERING District Energy Management tool and HAN Smart Gateway that enable the creation of local communities of residential and commercial Prosumers. These prosumers will be fully empowered to participate in the electricity market at the LVS level of the smart grid, by receiving dynamic (price or power) signals for better decentralized decision regarding peak shifting, and by self-consumption, resulting in lower energy bills, and access to the energy market in new ways. Additional value that the MAS Platform unlocks is focused on DSO monitoring of the LV-grid congestion management situation that can be used for short or longer-term planning. A converged business orientation that represents the conceptual requirements of industrial stakeholder segments: Energy Supplier (Engie), Telecom Operator (TI), Cyber-Security Service Provider (CCS), DSO (LAB), Metering Company/ESCo (SMS, Plc. ), and IP provider (CEA). A first business model scope and vision presented in the form of 19 collaboration opportunities. There are 10 primary business models (including “Flexibility as a Product”, “Consumer: In home optimization services”, “DSO: Flexibility services”, and “Joint Services Business Models”), and 9 supporting business models (Including “Knowledge & Data Services”, “Telecom Services”, Security Services”, and “Referral Services). An alignment of the project vision, optimization approach, project use cases, high level requirements, and business model opportunities is attained. A mapping between the business model opportunities and the use cases, which facilitates the alignment of business models (WP1) and technical architectures (WPs 2-6). The identification of 21 High-Level Requirements to be considered across project architecture design, technology development, and technology validation. The initial feasibility assessment of 5 European target markets (BE, IRE, IT, FR, UK) under three macro perspective criteria: regulatory requirements, tariff schemes, and penetration of DER capacity. According to this initial analysis, Belgium and Ireland are most suitable to Mas2tering type solutions. A next step in business model development work will include a deeper study into the business strategy and collaboration opportunities present between the involved actors (D1.5, M24) by completing the Multi-Sided Business Model Development Tool (Annex B and displayed above). In parallel, market feasibility analysis will continue with focus on developing the methodology and information necessary to support quantified analysis of the business cases and final development of the Mas2tering business models (D1.7, M36).